Joint favourite Bondi Beach was handed the St Leger, after Simple Verse was disqualified following a stewards' inquiry at Doncaster. Simple Verse had emerged the narrow victor after a tense finish. But after a lengthy inquiry, stewards ruled Simple Verse was the main culprit of extensive barging in the final furlong and reversed the placings. It gave trainer Aidan O'Brien his fifth victory in the final classic of the season. Simple Verse had been supplemented at a cost of £50,000 and would have been the first filly to win the race since 1992. Her trainer Ralph Beckett was not impressed. "I am astonished," he said. "We will appeal this. "Clearly both horses leaned on each other. Can you really say it was all her fault?" 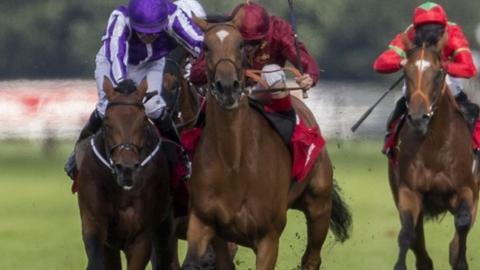 It was the first time a horse had been disqualified from first place in the St Leger since 1789. Bondi Beach's jockey Colm O'Donoghue felt the stewards were correct in their decision. "My momentum was stopped," he said. "I tried to have a fair shot at it and I got impeded." O'Brien also had the third horse in the race as long-time leader Fields of Athenry stayed on. A stewards' inquiry was also needed before the outcome of the £638,000 Irish Champions Stakes could be determined at Leopardstown. After starting 5-4 favourite, Derby winner Golden Horn was confirmed as the winner, despite bumping into Free Eagle, who eventually finished third.